Echolocation is the biological sonar system used by some animals to navigate or locating prey. They emit ultrasounds in various frequencies that reflect back from the objects. These animals have special ear and brain adaptations to detect the reflected sound. Echolocation is found in animals like Bats, Toothed Whales, Shrews, Dolphins and in some birds. The interesting feature is that Bats emit FM frequencies for precise range discrimination and localization of the target. The range of the reflecting sound is measured by the time delay between the origin of sound and reception of echo. Bats have enlarged ear flaps and super sensitive ear drum to gather sound. The ears are located slightly apart so that the echo returning to the two ears has different loudness and arrival time. These differences are used to detect direction and distance of the object. Bats can also detect the size of the object or animals using the echolocation. Ultrasound is produced from the larynx of bat and emits through mouth or nose. The frequency of ultrasound range from 14000 to 1 lakh Hz. The acoustic features of the sound include dual mode frequency generation. 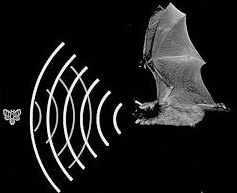 Bats emit ultrasound in two frequencies like Frequency Modulation (FM) and Constant Frequency (CF). A particular set of sounds may have either one or both the frequencies.FM sound is in broadband with a downward sweep or range of frequencies.CF tone is narrow band and stays at a particular frequency throughout the duration of call. Intensity of the sound range from 60 to 140 decibels and composed of a series of harmonics. Each call last for 0.2 to 100 milli seconds with a pulse interval which gives the information about the target. A pulse width of 100 ms allows sound to travel 34 meters so that bat can detect the object located 17 meters. The FM sound gives advantage of precise location of the object due to the broad band sweep of the sound waves so that bats get better resolution of time delay between the call and echo. FM signals are beneficial for hunting prey because of precise localization and short duration of signals. The CF signals allows to detect the velocity of the moving target. The ear and brain of bats have special structures to detect and process the auditory information. The ear drum in bat is highly sensitive and the ear pinna has many folding. These features help them to sense stereotype echolocation calls of their own species. The Basilar membrane of the inner ear and cochlea has special adaptations for echo processing. The auditory neurons are specially tuned for narrow frequency signals. The Inferior colliculus of the mid brain integrate the auditory information and send to the Auditory cortex of the brain. The Auditory cortex is large in size than other mammals and each part of the auditory cortex process different information. The auditory cortex has FM sensitive nerve cells. These cells respond to two FM signals – the call signal and Echo. The neurons are specially arranged to sense both call and echo with a time delay. The Auditory cortex also has CF signal detecting neurons that sense two combinations of CF signals like call signal at 30 kHz and echo at 60 or 90 kHz.